Challenges to the future development of Alberta's energy resources continue to surface. These challenges, political, economic and technical, need to be addressed in a broad and coherent framework that ensures Alberta and Canada's future prosperity. What role might a Canadian Energy Strategy play in achieving our goals? How does environmental monitoring relate to our challenges? These questions, among many, need to be addressed with urgency and focus so that we can continue to develop our resources while improving our quality of life, including our environmental responsibility. Dr. Doucet assumed the position of Interim Dean of the Alberta School Of Business on January 01, 2012. He joined the School in 2000 and since 2005 had been the Enbridge Professor of Energy Policy. His professional interests are in energy and regulatory economics and policy. 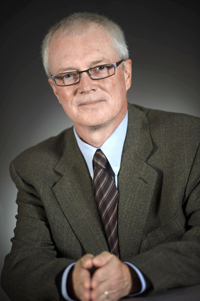 Dr Doucet is a past President of the Canadian affiliate of the International Association for Energy Economics (IAEE). His research has appeared in journals such as The Energy Journal, Energy Economics, the Journal of Regulatory Economics and the Canadian Journal of Economics. He is a member of the Editorial Board of the Journal of Regulatory Economics, and between 2000 and 2006 he was Editor of the journal Energy Studies Review. He continues to contribute to public policy in the areas energy markets and environment.